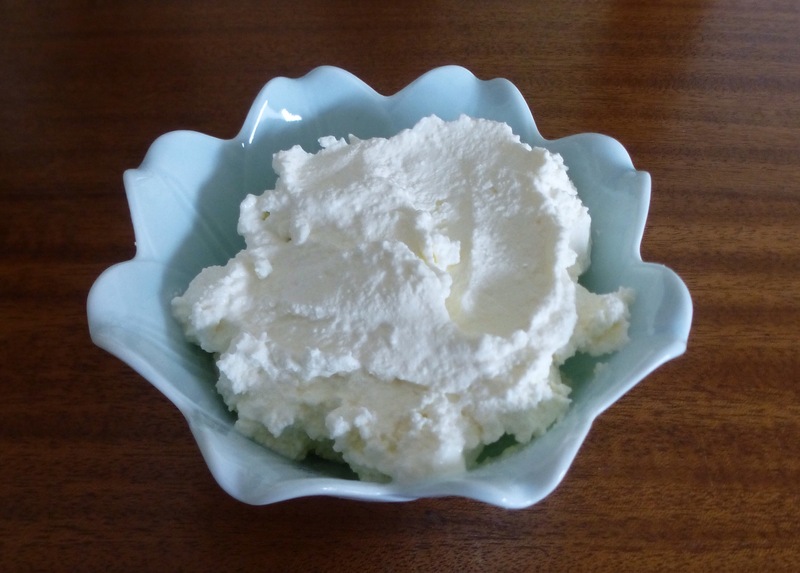 I posted a recipe for homemade ricotta cheese almost four years ago. Using just milk and buttermilk, it has a stiffer curd and works beautifully when well-drained for cannoli cream. When I want to make a more delicate, soft, and creamy ricotta cheese for eating as is, or using on pasta or as an appetizer, I add heavy cream and salt to the milk and buttermilk. The addition of heavy cream gives the cheese a sweeter flavor and more creamy texture. The recipe comes from In Jenny’s Kitchen. We are fortunate to have access to local raw milk, which I believe produces a better-flavored cheese than pasteurized whole milk from the grocery store. The fresher the milk, the better the cheese. If I use raw milk that is close to its expiration date it is less likely to develop strong curds. I’ve also found that I prefer the flavor of local cream and buttermilk, too. Using grocery store buttermilk will produce a tangier and less-sweet cheese. I recognize that some readers may not have access to local fresh dairy products, so just use the best products available to you. We make this ricotta often when entertaining and it is always popular with guests. It also makes a lovely summer dessert cheese mounded with fresh, ripe berries, cherries, melons, or peaches. Combine all ingredients in an 8-quart heavy bottom pot. Stir to mix well. Attach a candy thermometer to the side of the pot. Turn the heat to medium and cook gently, stirring occasionally to keep the milk from sticking to the bottom of the pot. Small curds should just begin to form around 160 degrees. Continue cooking until you reach 170-180 degrees; the curds appear larger as the milk begins to boil. Once you have larger curds, lower the heat and allow to cook about 4 minutes longer. Remove the pot from the heat and let sit for 20 minutes. While the cheese is sitting, line a colander with fine-netted cheesecloth. Gently spoon the ricotta cheese into the cheesecloth-lined strainer. Let cheese curds drain 5 minutes, then transfer to a storage container with a tight-fitting lid. Chill until ready to serve. It will keep in the refrigerator for two weeks. Makes 3 lbs. of ricotta cheese. This entry was posted in Appetizers, Christmas, Desserts, Easter, Fruit, preserving, Vegetarian. Bookmark the permalink.